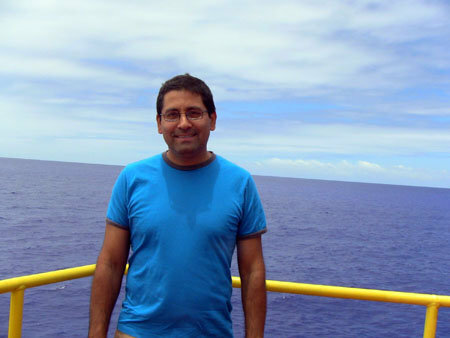 Carlos Alvarez-Zarikian is the Staff Scientist on Expedition 329 of the JOIDES Resolution. He is the USIO-IODP (United States Implementing Organization – Integrated Ocean Drilling Program) science representative and is responsible for planning and implementing the expedition, and for coordinating the science that goes on with the expedition chief scientists.He was born in Caracas, Venezula and grew up there, where he attended school. Some of his summers were spent in Germany, the U. S., and France and he developed a healthy appetite for traveling. He was always interested in the natural sciences. During his early years growing up, he wanted to be a marine biologist but his interest changed to oceanography as he reached high school age.His family encouraged him to go into the business field but his love of the natural world won out when he continued on to college. Carlos got a technical degree at a school of oceanography in Venezula and then went on as in intern in the Venezulan oil industry, where he received training in biostratigraphy and applied micropaleontology. After two years working in the oil industry, he moved to Miami where he studied at the University of Miami and earned his BS degree in geology, then a Masters degree (1998) and PhD (2003) in marine geology from the Rosenstiel School of Marine and Atmospheric Sciences. During this time, Carlos became involved with several interesting projects. One was as a paleoenvironmental consultant for an archaeological group searching for the ancient city of Helike in Greece, which was destroyed by an earthquake and tsunamis in 373 B.C. Carlos appeared in a BBC film about the project.In addition to this work, he was also conducting research on anthropogenic impact on the Florida Everglades, Florida Bay and the Gulf of Mexico. Some of his advisors at the University of Miami were involved with ODP (Ocean Drilling Project) legs and told him about working for IODP (Integrated Ocean Drilling Project). In 2004, he saw an advertisement for Staff Scientist, applied, and was hired. This is his 3rd cruise as Staff Scientist on the JR, although he has sailed four times and will be going out again next year. In his spare time, Carlos used to be a passionate scuba diver and sailor. He participated in sailing events in both Venezula and Miami. Now, living in Texas with his young family, he likes to spend time with his 2 year old daughter and his wife and really enjoys photography.